Steel was in short supply during the height of World War II, and there was nothing to be done but invent a replacement. One proposal was called Pykrete, a mixture of ice and sawdust that melted incredibly slowly. The idea faded away once the war ended—but now, a group of Dutch architects and engineers are reviving it. In a big, big way. First, a little backstory. Pykrete was created by a British inventor named Geoffrey Pyke. As io9 explained a few years ago, Pyke was convinced that he had a better option to replace steel: A special mixture of about 14 percent sawdust and water. When frozen, this special fluid would form an amazingly strong hybrid material that didn't melt and was resistant to shattering. An artist's rendering of a pykrete-built ship. Via. In fact, the British government even considered using it to build an aircraft carrier. But when the war ended, Pyke's novelty faded away, though it wasn't entirely forgotten (maybe you saw this MythBusters episode about the stuff). Enter the Eindhoven University of Technology, where students and professors are resurrecting pykrete for use in architecture. Last year, a team build the world's largest ice dome with the stuff (check out an incredible making-of video here). Using an inflatable dome, they were able to spray enough of the mixture onto its surface to create a free-standing dome with a 98-foot span. Top image: Bart van Overbeeke/PykreteDome. Bottom Image: Joep Rutgers. Now, the team says they're ready to take it to the next level. This time, they're building a 1:4 model of Barcelona's famed Sagrada Familia out of pykrete. "We could have just decided to build another, even larger, dome," said professor Arno Pronk. "But in building terms the Sagrada Familia is a much bigger challenge. And of course it's very recognizable." A mockup of the project. This winter, a team of 50 will get started on the project by creating a inflatable mold of the museum in northern Finland. Then, they'll cover it with snow and blow the water and sawdust mixture over it—which will freeze and form the mysterious pykrete, which is three times as strong as normal ice. 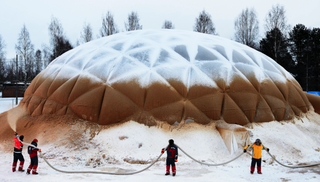 Lead image: Bart van Overbeeke/PykreteDome.